Some closed containers may be exploded by vapor pressure in the microwave. Plastic foams have air pockets that are not safe if used with the microwave. Do not use styrofoam in the microwave. Some types of plastic can absorb microwave energy and become very hot so it is not safe. But today there are some plastic food containers that included with certain safety information for the microwave. Generally safe container is made ​​of glass or ceramics which can be passed through by microwave. All metal objects such as spoons, forks, aluminum foil, will work like antenna if put in the microwave and allow the electric current flows, and any pointed metal will cause electrical sparks. Metal object will also work as a heating element. This effect can be different for each metal objects, depending on the shape and composition. Today there are some metal object that is designed for use in microwave ovens. 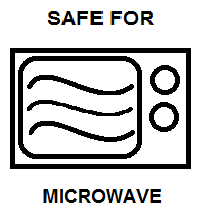 Some products are safe for microwave and it is stated by drawing a sketch of the microwave, sometimes accompanied by a written statement printed on the product. Some organizations are studying the recycling symbols to determine a product is safe for microwave, generaly recycling symbol type 5 is considered safe for the microwave.